I’m so pleased to finally be back painting again, after a long winter of no sunlight, no energy, and no time. 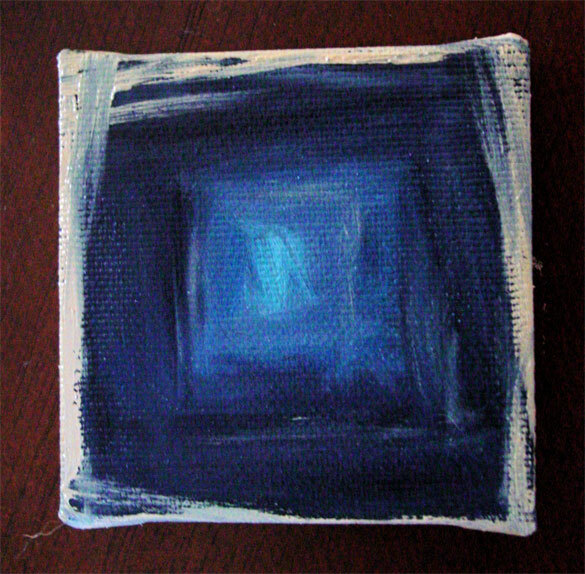 This is a tiny painting, mostly in shades of blue, and it looks to me like some sort of well or tunnel with a light beckoning at the end, luring one to explore what’s beyond the buff frame. I’m actually very happy with this painting, as well. I love doing abstracts like this, I always have, but I’ve been drowning in weebles lately trying to get my Valentine’s Day projects done for my Etsy shop. I love doing the weebles, but like anything, sometimes variety is better. I have a sort of a show next month! The Book Shop in Hayward, CA, has artists in their shop window every month, and I’m to be Miss February. This piece is among the ones slated to go in the window, provided it dries in time. Like all the other tiny paintings, this one comes with a wooden easel for display, which can tuck into a bookcase, sit on top of a computer monitor or mantelpiece, and bring a bit of mystery into your space. In and In and In, 2.75″x2.75″ oil paint on canvas with 5″ wooden easel.